GREENSBORO, N.C., USA, Feb. 23, 2018 – As resistant kochia continues to spread across the U.S., Syngenta provides key strategies to best manage the highly adaptable, genetically diverse weed. There are a number of key characteristics of kochia that make it especially difficult to control. 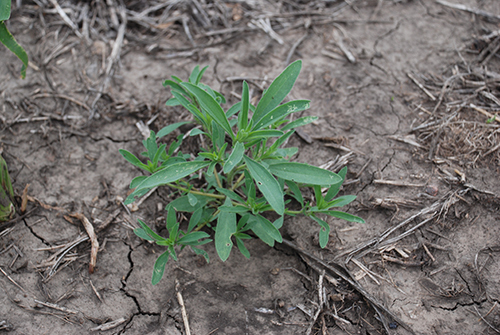 According to the United Soybean Board, kochia is tolerant to hot, dry conditions and soils with high salinity. It can produce up to 30,000 seeds per plant, its root system can extend down 15 feet and measure 21 feet in diameter, and the weed itself can grow up to 6 feet high. In addition, herbicide-resistant kochia is rapidly evolving due to short seed life, high genetic diversity and heavy reliance on herbicides for control in minimum- and no-till cropping systems. Because of these key challenges, many growers have significant difficulty managing resistant kochia. Many growers have learned that managing kochia is not a one-step process. Wuerffel said Syngenta has some great options to help control kochia in soybeans, corn and cereal crops. Growers have found value in Syngenta herbicide solutions that help manage resistant kochia. Backed by decades of research and development, Syngenta has been at the forefront of introducing herbicides with multiple, effective modes of action to help fight resistance. The Syngenta Resistance Fighter® program provides education, local recommendations, and a comprehensive herbicide portfolio to help growers and retailers effectively manage resistant weeds in their area. Learn more about how to identify and manage kochia in this educational video with Wuerffel. ©2018 Syngenta. 410 Swing Road, Greensboro, NC 27409. Important: Always read and follow label instructions. Some products may not be registered for sale or use in all states or counties. Please check with your local extension service to ensure registration status. Acuron is a Restricted Use Pesticide. Acuron®, Axial®, Dual Magnum®, Resistance Fighter®, Talinor™ and the Syngenta logo are registered trademarks of a Syngenta Group Company. All other trademarks are the property of their respective owners.